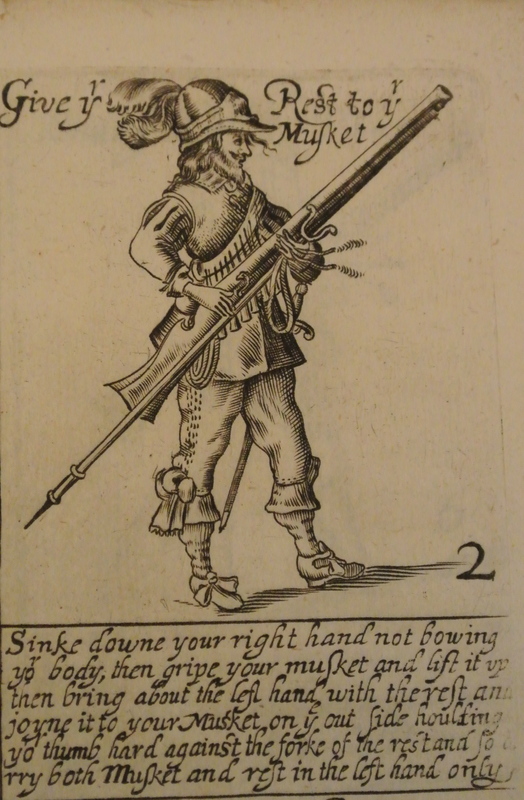 From The Military Discipline wherein is Martially Showne the Order for Drilling the Musket and Pike, published by Thomas Jenner, London 1642. This is plate four of the drill book published just before the wars broke out. I’ve no reason to suspect this is anything other than portraits of the trained bandes of London at their postures. These guys are dressed in high status clothes, braided breeches and slashed sleeves. Not the kind of clobber you would wear to take the the field. We are still crunching through musket drill, broken down into all the separate moves that would most probably be thrown away on the battlefield. All back views this time. Notice from the legend that numbers 11 and 12 are using a ‘charge’ to introduce powder down their barrels. Victorian wisdom always suggested these bandolier containers were called apostles. This is number four in the series. I took the photos from the original book. 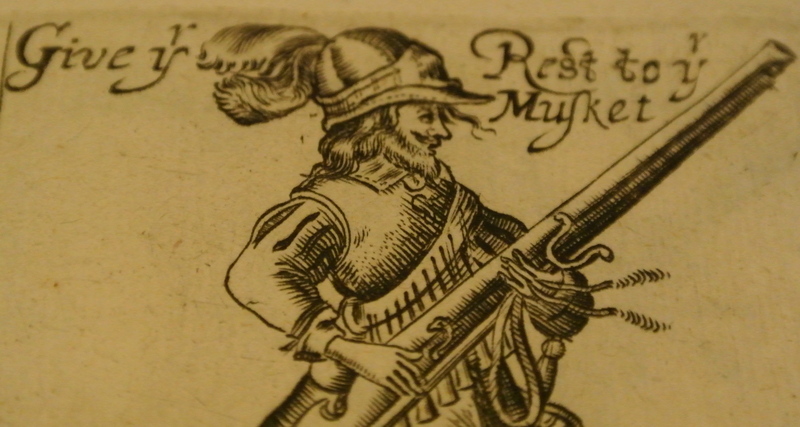 From The Military Discipline wherein is Martially Showne the Order for Drilling the Musket and Pike, published by Thomas Jenner, London 1642. This is plate three of the drill book published just before the wars broke out. I’ve no reason to suspect this is anything other than portraits of the trained bandes of London at their postures. These guys are dressed in high status clothes, braided breeches and slashed sleeves. Not the kind of clobber you would wear to take the the field. Some fancy garters on display here too. This is number three in the series. I took the photos from the original book. from The description and use of the carpenters-rule together with the use of the line of numbers (inscribed thereon) in arithmatick and geometry. And the application thereof to the measuring of superficies and solids gaging of vessels, military order interest and annuities: with tables of reduction, &c. published in 1656. This is the fronticepiece engraved by Richard Gaywood. 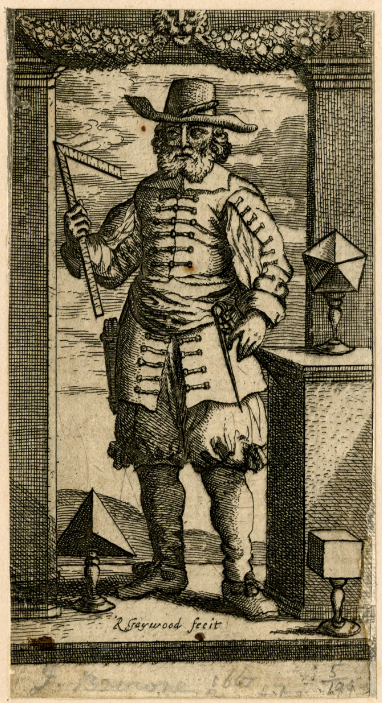 Here is John, surrounded by a selection of geometric objects brandishing his carpenters rule. His coat is decorated with tapes or braid that extend outwards from the buttons at the centre and his sleeves are open at the seam to show his shirt sleeves. His breeches are full and gathered at the knee and his hose quite wrinkled at the heel. He has a stout pair of shoes and a wide brimmed hat. Nice big bushy beard too! or, The muses interpreter, explaining the historical mysteries, and mystical histories of the ancient Greek and Latin poets. Here Apollo’s temple is again opened, the muses treasures the sixth time discovered, and the gardens of Parnassus disclosed more fully; whence many flowers of useful, delightful, and rare observations, never touched by any other mythologist, are collected. 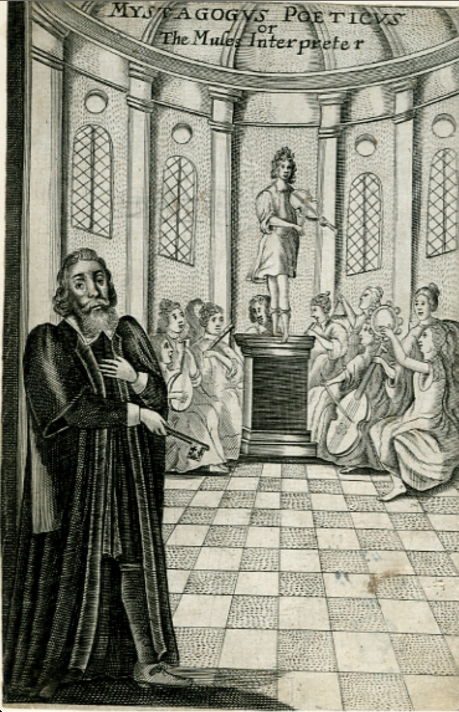 A classical work by the scholar and Church of England Clergyman Alexander Ross published in 1647. Ross was something of a colourful figure. As his entry in the Oxford Dictionary of Biography says “virtually all of his prolific output was underpinned by a violent and often vituperative indignation directed at other authors”. He is also credited with the first English translation of the Qur’an. This is the front page showing Alexander in his gown over a pair of breeches, showing a nicely turned leg with a smart shoe and stocking. In the background a group of classically dressed musicians provide and accompaniment. 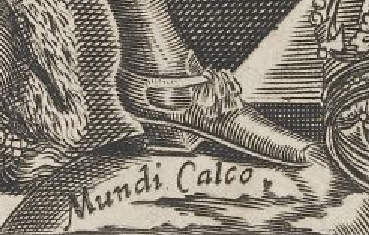 Close up of Alexander’s leg showing the detail of his shoe. 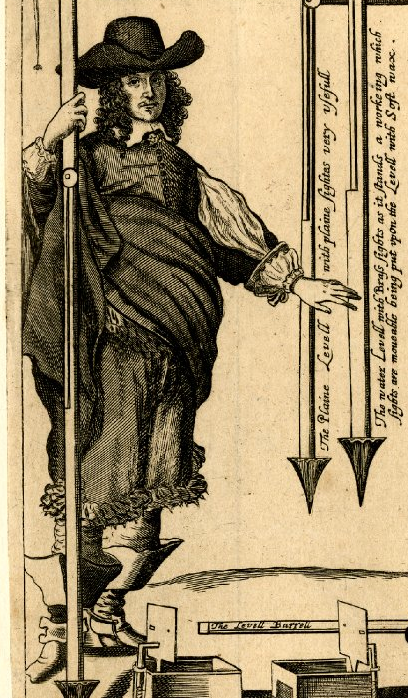 Further into the 1652 book on agriculture and husbandry there are two more interesting illustrations. On page 65 we see the author Walter Blith with his surveying instruments and further on a labourer demonstrating a spade amongst pictures of other tools. 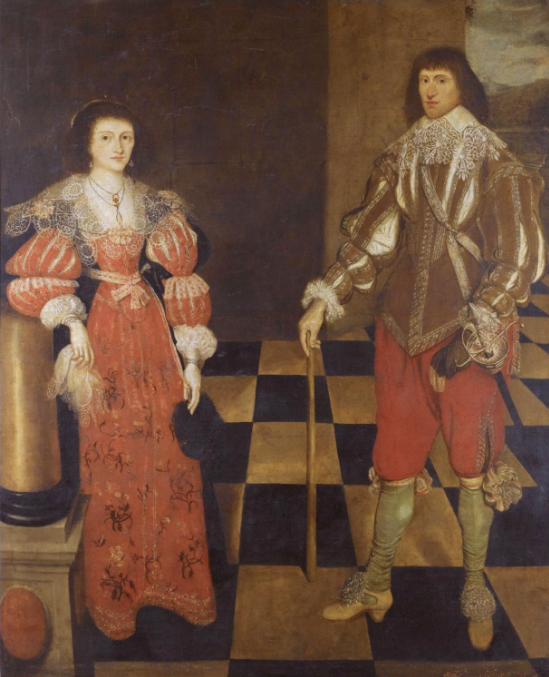 Walter is dressed in a quality doublet with slashed sleeves, beribboned unconfined breeches and some splendid soft riding boots. The sleeves of his shirt appear to be gathered into a small cuff but pulled through the ends of his shortened doublet sleeves to emphasise the amount of linen used. He’s also wearing a jauntily cocked hat and some kind of wrap around his stomach that is possibly artistic licence as it looks more classical than Early Modern. I’m not sure how you’d stop something like that from falling down. He’s not dressed for surveying I suspect. This is the supervisor at work. 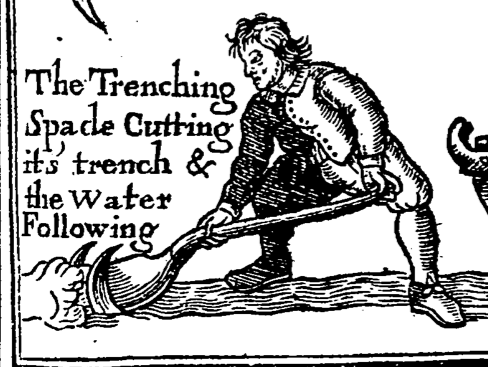 And on page 69 an echo of the labourer on the frontispiece using what we are now told is a trenching spade. Sadly he’s ditched (no pun intended) his intriguing hat and unbuttoned his coat but we can now see better details of the breeches that are gathered at the knee and count the number of buttonholes on a working man’s doublet. Notice for a working man in the dirt he’s actually wearing shoes, not boots. 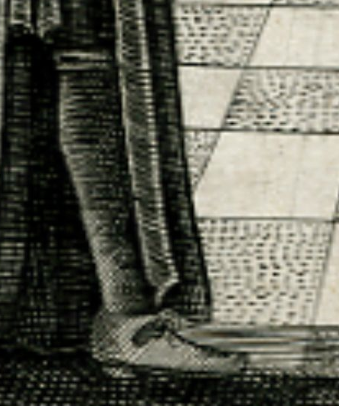 His left hose seems to have a clock, (or gusset) in the front of the foot. They are usually found on the side. Interesting. Painted by someone from the circle of the artist Gilbert Jackson. Henry was the second Earl of Monmouth and a staunch royalist, though he took little part in the war. This picture came up for sale recently at Sotherbys. It looks slightly earlier than the 1640s but not by many years. Sir Henry is wearing oddly mismatched colours in his doublet and breeches, though his doublet is rather splendidly slashed and set off with a falling band that is mostly lace. 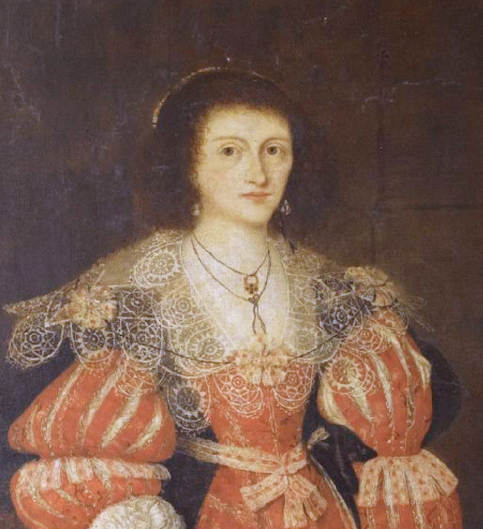 Mrs Sir Henry (Martha) has a red dress, the sleeves of which are slashed and gathered at the elbow and with skirts that look to be possibly embroidered. Henry’s shoes are fine with ribbon rosettes, though his hose could do with regartering, though those ribbon ties look too complicated to actually hold anything up! Here’s a detail of the fine lace on his band. And the even finer lace worn by Martha which looks more like gossamer than fabric. You can also see the dark over gown she’s wearing in this closer view. 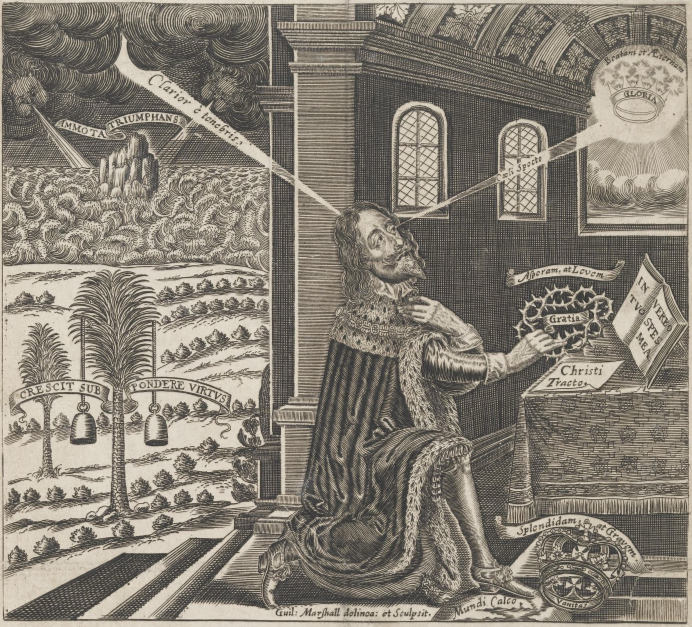 Mentioned in the previous post, being hung in the Royal Oake of Brittayne, Eikon Basilike was the purported autobiography of Charles I published after his execution. There is a really good wikipedia entry on the book which I recommend if you are interested as I don’t intend to go into the muddy waters of discussing who was the author or explaining the latin inscriptions. The engraving is by William Marshall and the date in 1648. Charles in in his kingly robes, and is holding a crown of thorns to suggest he is a martyr. Apart from that we can see a pair of heeled shoes, fine hose and the arm of a doublet sleeve. Simple cuffs and a small falling band is all the linen on show. His shoe is worthy of a close up though. Nice blocked heel and square toe. 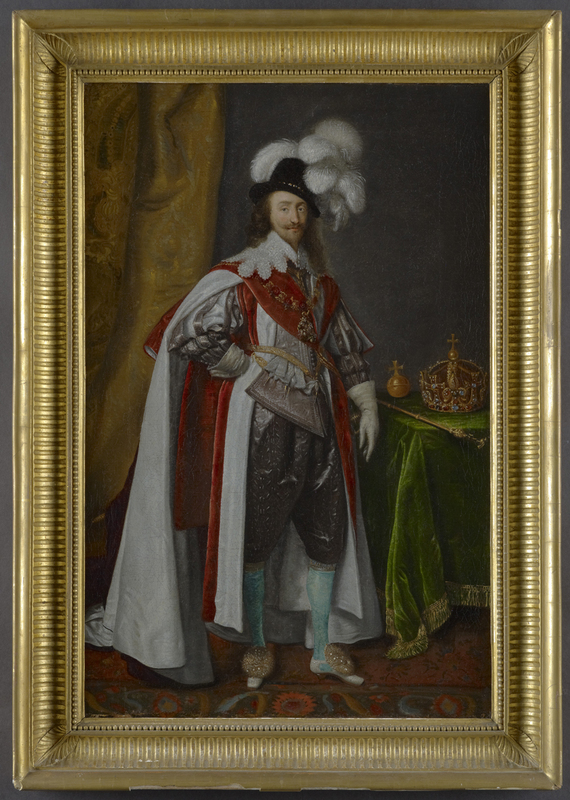 Painted by an unknown artist of the English school, this portrait hangs in the Tate collection. 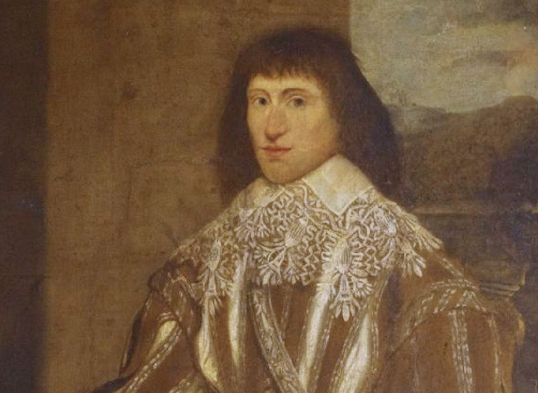 Thomas Pope was nephew of the 2nd Earl and seems to have trodden a middle path, for although his uncle was prominent in the royalist cause, he was imprisoned by the Royalists for six weeks during the war and later in the 1650s, held by the other side for complicity in a “Cavalier Plot”. The portrait is rather old fashioned in style with a turkey carpet and silk drapes, but his clothes are smart and understated. Black doublet and breeches and an off the shoulder cloak, though the details are tricky to see in a photograph. He’s also wearing a needle lace edged falling band. There are some nice details however of his shoes and cuffs. His silk hose are very slightly wrinkled, but his shoe rosettes are top notch and if you look closely, you can see the seams of his hose that show the triangular inset to make them fit around the foot. Also notice the inkle braid garters that match his hat band and the height of his shoe heels. This detail of his right hand shows nicely his soft leather gloves, the lace on his cuffs that matches his falling band and the turn back on his doublet revealing the lining of the sleeves.